All stores offer FREE SHIPPING on this item. Weight capacity for top bunk: 200 lbs. 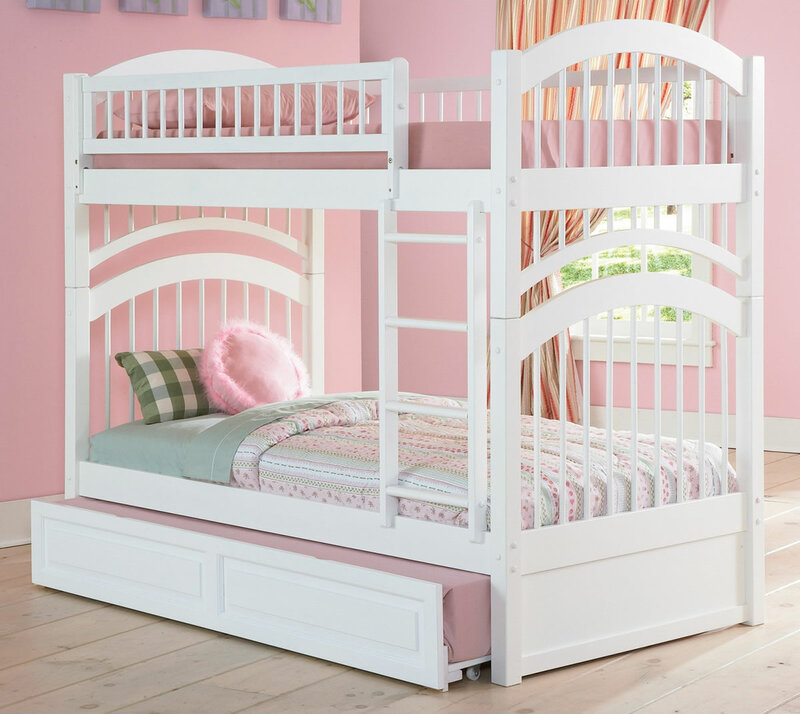 The Windsor name has a certain royal sound to it, and this bunk bed, with its charming double arch design complemented by mission style slats and matching guard rails does kind of live up to it. But not all is about looks (at least not when bunk beds are in question); build quality is of (at least) an equal importance and this is another area where the Windsor line, as is the case with Atlantic Furniture bunk beds in general, seems to stand out; it is made of solid hardwood, with 26 steel reinforcement points. The product is available in four different finishes, making it a good fit for a vast number of surroundings. The optional under bed storage drawers or a trundle bed, plus the ability to easily split the bunk bed into two separate beds further increase this line's functionality and add to its value. Let's review what users have to say about it. Durability -- sturdiness, quality of build: the majority of reviewers chose to attest to these qualities first and foremost. The bed is described as a well designed; strong; beautifully constructed piece of furniture. The craftsmanship receives special praise, with an emphasis on the ease and smoothness with which the pieces assemble, but also the perfectly aligned radius for the upper and lower bunks (very important for this sort of design). The ladder gets several favorable mentions, particularly for featuring flat slats instead of round poles, which makes climbing more comfortable and safer. 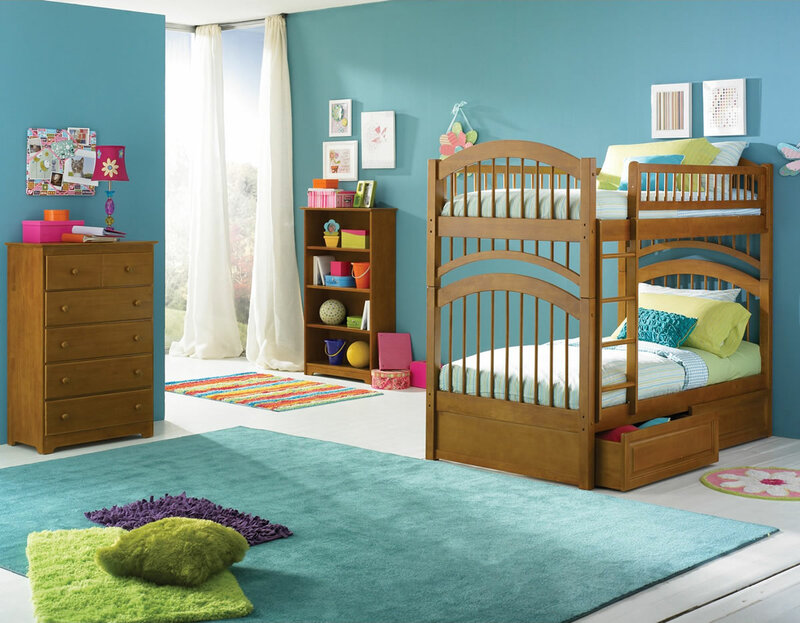 The building material for this bunk bed is Asian hardwood, described as thick and heavy and solid quality wood. Attractive design -- this you can check out yourself by clicking on one of the thumbnails to the right, and although it won't be the same as having an up close and personal experience it will give you a general idea of the bed's stylish presence. Pay special attention to those beautiful arched head and foot boards. Ease of assembly -- a view to half a dozen or so boxes the bed ships in can be a little disheartening, but don't worry: "easy to assemble" is one of the most often repeated phrases associated with this product. 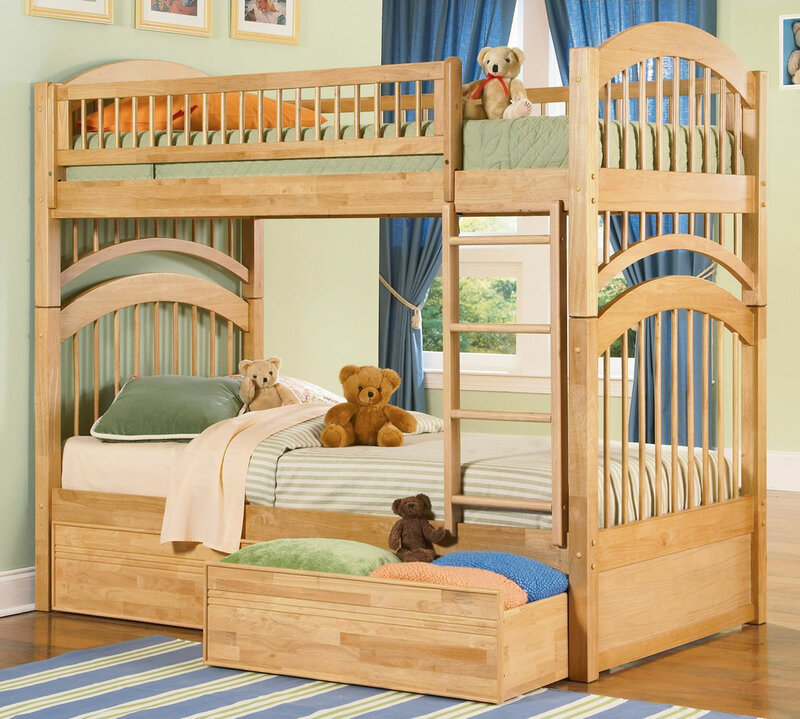 Most users report they've been able to put the bunkbed together in a few hours, sometimes less. It is generally consented that you do need two adults to do the job though. The enclosed directions received mixed reviews; some find them thorough and easy to follow, while others advise to throw them away and just follow your intuition. To each his own. Drawers -- most buyers recommend getting the bed with the under bed storage drawers. 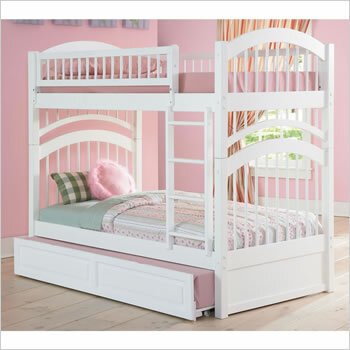 They are described as well constructed, big and deep -- with plenty of space for bed linens, covers, toys etc. The drawers come on rollers but there are no tracks, so they can look askew if they are not rolled under the bed carefully. Complaints associated with this product are largely minor: missing screws or parts, wrong manual, minor difficulties with assembly, minor imperfections in the finish and similar. There are a few objections about parts not fitting together. One user in particular claimed that the ladder was half an inch too long and that the headboard was too wide. Another buyer was not happy with the amount of steel that is used for reinforcement and was also displeased with the construction quality of the trundle bed. 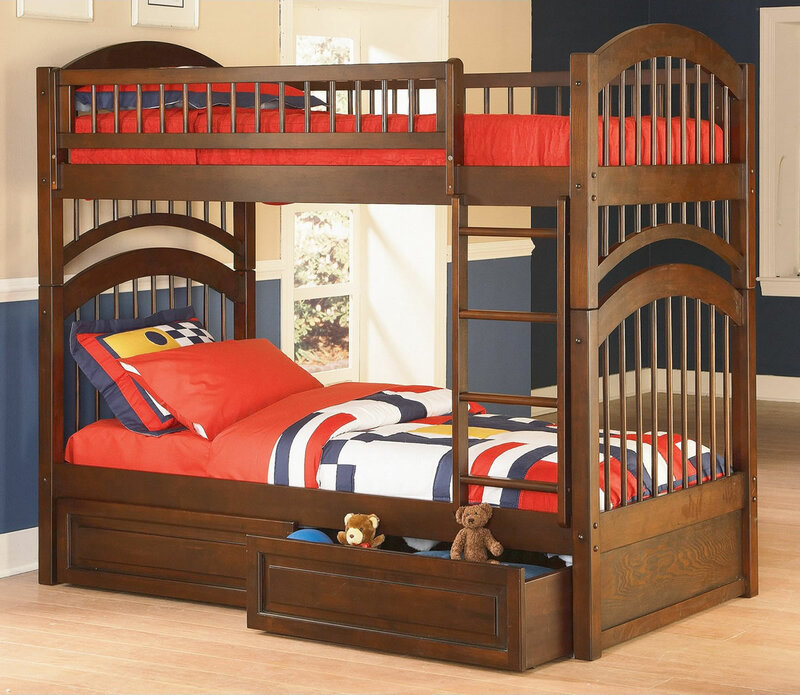 If you are looking for a safe, sturdy, spacious and great looking if somewhat conservative bunk bed at an affordable price, the Atlantic Furniture Windsor twin over twin seems to be a worthy contender.